Remember last week when I mentioned how much we enjoyed the chicken we made on the grill? The boneless skinless chicken breast tenderloins in mesquite marinade? Well, we did. So we made them again this Sunday. Is this your perfect easy summer meal, or what? 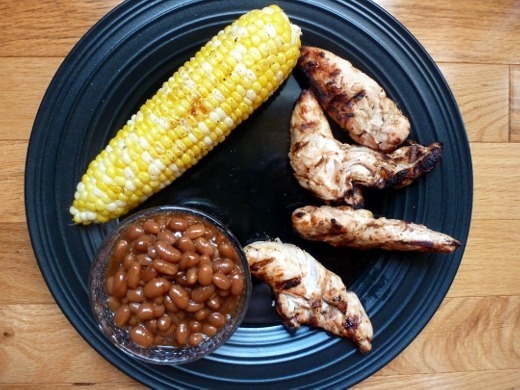 Grilled corn with Old Bay seasoning, mesquite grilled chicken, and bourbon beans. Something green thrown into the meal probably wouldn’t have hurt, but instead we threw in something PURPLE. On Sunday my mom and two aunts were in the area for a high school open house, and stopped by to check out our house before heading back home. 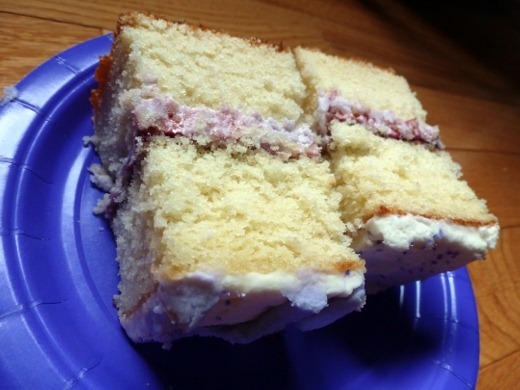 My mom’s cousin sent a couple pieces of homemade cake over for me and the huz. Yummay! Sounds like a win. Did you do any grilling this weekend?